London is known as “the city of 100 villages.” That fact of facts is one of the reasons this is the most livable major city in the world. Below are two of the top walks in London. The City of London is the oldest part of London, dating back to AD50. Roman invaders built a bridge over the Thames – the only crossing into the City for 1,700 years – and created a settlement around it, named Londinium. The new settlement was well placed on the river, and traders soon flocked to Londinium to buy and sell goods, making it an important commercial centre. If you head to the square mile and walk around, you will encounter Roman sites everywhere. Today, most of the remains of Londinium are 7 metres (23 feet) below where the modern day roads are: 2,000 years of building, fire and bombs have hidden much of the Roman settlement. Many fascinating items have been discovered during foundation works for new buildings and archaeological digs, and are kept at the Museum of London. At the junction of Cannon Street and Walbrook is the site of the Temple of Mithras, built towards the end of the second century. The area where it stood is now occupied by Bloomberg’s new headquarters, currently under construction (2014/15). It was during the construction of the previous building in 1954, that the remains of the temple were discovered. The third century site, which stood on the east bank of the Walbrook river, was a 20th century revelation: crowds flocked to see it, and queues stretched around the block. Mithraism was a secret mystery cult that was popular during Roman times. You can see the spectacular finds from this site and learn more about the Mithraic religion at the Museum of London. This is my most enjoyable London walks as it has something for all the family. You know the City of London is the capital of international finance. But have you visited Smithfield meat market? You know the City is home to bankers – from the Governor of the Bank of England to the men and women working in the clearing houses crowded into the Square Mile. But did you know one of those banks operates from the site where Rowland Hill, the social reformer, invented the penny postage stamp? As you walk through the square mile, you will come across amazing buildings and see Londons past. This is another of my Sunday afternoon classic London walks my family and I sometimes do. Peering up at the Lloyd’s of London building at One Lime Street walkers in the City see a flamboyant office tower – steel frame, glass curtain, exterior staircases and ducts, coloured lights. In fact, the building designed by Richard Rogers and completed in 1986 does not contain offices. It houses a market like the markets at Smithfield, Billingsgate and Covent Garden. Instead of meat, fish or vegetables, however, the goods on sale here are insurance policies, and instead of hawkers the sales people inside the building are highly qualified professionals known as underwriters. Walking down St Mary Axe visitors approach Number 30. 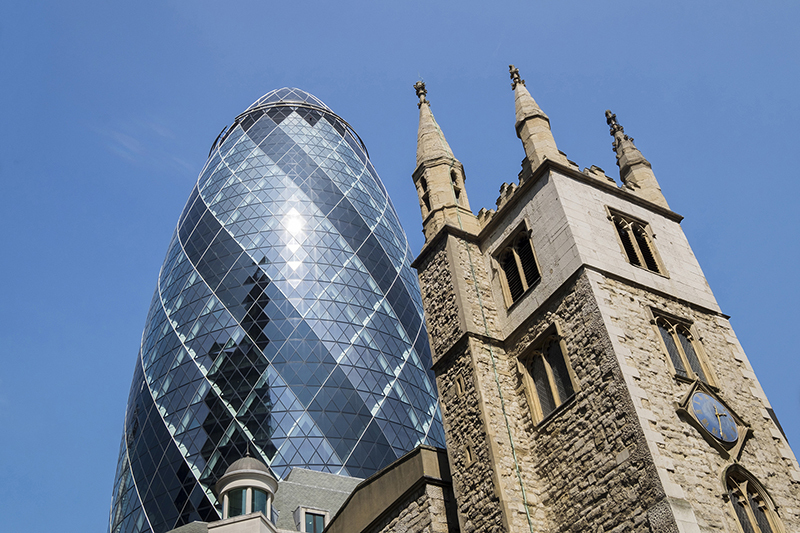 The Gherkin, as the building is popularly known because of its pickle shape, looms above an ancient skyline. There’s St Andrew Undershaft, one of the few City churches to escape both the Great Fire of 1666 and the Luftwaffe’s bombing during the second world war. There’s St Helen’s Bishopsgate with its medieval courtyard. Lastly youll get to see the Gherkin. Amazing iconic London building. Although the streets of the City of London are not paved with gold there’s plenty of it under them if walkers know where to look. One of the largest caches of the precious metal in the world lies in a vault beneath the Bank of England. Exactly how much gold is stored under Threadneedle Street, where Threadneedle Street meets Bank junction near the 1844 statue of Wellington, is a state secret. But it is known that the bullion is neatly stacked in piles containing 77 bars each with each pile weighing approximately a tonne. There is a museum at the Bank of England, very fascinating and if you’re strong enough, they even let you try and pick up a gold bar with one hand… Good luck! As you walk West away from the Bank of England and past England’s most famous Cathedral you come to the end of the City proper. With St Paul’s Cathedral casting its shadow over the London Stock Exchange at 10 Paternoster Square God and Mammon stand in stark relief. The cathedral bells toll the immemorial hour. The Stock Exchange bustles with people working second to second. Standing in the Square visitors can switch their gaze from Wren’s masterpiece to the Exchange and dwell on the difference between heavenly and earthly pursuits. A mile away is Fleet Street. Fleet Street is synonymous with print journalism. The world’s first newspaper, The Daily Courant, began publication there in 1702. Over the next three centuries virtually all of the country’s great newspapers were written, edited and printed there. Today, however, despite the association in the public mind between Fleet Street and print journalism, the actual road running parallel to the north bank of the Thames has nothing to do with newspapers.